For an efficient and safe performance of industrial cooling towers the recirculated water must be proficiently conditioned and disinfected. Also, the water quality must be regularly checked. Currently, the conditioning / disinfection process of the recirculated water is predominantly pro­vided by means of partially toxic chemical dosing, which is detrimental and, ultimately, will have a negative influence on cooling tower operation (e.g. corrosion caused through ­biocide). 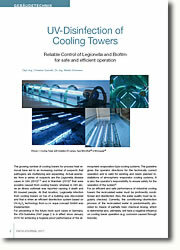 Next follows a general function description of a cooling tower and its correlation of the observed parameters during operation. The established procedure for the control of these parameters will be described and its impacts analyzed. Alternatively, Enviolet GmbH will present its developed concept for disinfection and stabilization of cooling towers based on UV-irradiation in combination with H2O2. Advantages of this process will be compared with the conventional approach by illustrating and comparing operating data of the cooling towers (total bacteria growth, Legionella bacteria growth, corrosion rate, operating costs). Cooling towers are semi-enclosed cooling systems in which the cooling effect is achieved through evaporation of water. See ­Picture 2: Air and water move in counter-flow direction thus a fraction of water is evaporated and the extracted vaporization enthalpy is generating a cooling effect on the remaining water within the system. As only pure water evaporates in a cooling tower dissolved ­solids concentration will increase, e.g. mineral salts, thus solubility limit of the dissolved solids will ultimately exceed and consequently resulting in inorganic mineral deposition (hardness) in the cooling system, which must then be removed again by a rather time consuming and costly effort. To prevent this concentration buildup, a portion of the recirculated water must be replenished with fresh water to prevent exceedance of the solubility limit of the dissolved solids. Typically, such a process is controlled via conductivity measurement. However, depending on the dilution demand, this replenishing process for maintaining the required volume of the recirculating water is an increase in operating cost of the cooling system. Picture 3 shows the relationship between concentration factor and fresh water supply demand. It is worth noting how the fresh water demand is decreasing with increased concentration (dissolved solids concentration) by constant recirculating water ­volume. With an increase of concentration from 1.5 to 3 fresh water supply is basically reduced to half. Since water costs are typically higher than chemical costs an increase of concentration can result in substantial cost savings. Cost savings above the concentration factor 4 are ­rather negligible and other interfering effects are having a negative system impact. Thus, an additional increase of the concentra­tion factor is not practical since a higher ­dissolved solids concentration would only increase the boiling point of the recirculated water and decrease the vapor pressure (ebullioscopy effect), which would reduce evaporation rate and resulting in a loss of cooling per­formance. Accumulation of dissolved solids in ­cooling towers coupled with typical ­temperatures of approximately 25 – 35° C are promoting ideal conditions for the germination of micro­organism e.g. Pseudomonas ­aeruginosa and Legionella spp… Bacteria are ­constantly introduced into the cooling tower from ­either the surrounding air or fresh water ­supply, which requires proper disinfection and microbial control. Biofilm buildup (fouling) on surfaces with contact of water are particularly problematic as this not only affects heat transfer but also promotes corrosion and impairs with the hygienic condition of the cooling tower. Since the recirculated water is in direct contact with air and is subsequently exhausted to the environment, it exists the possibility that, despite the use of demisters, water droplets entrained by the air stream escapes the cooling tower in form of an aerosol. It is due to this fact that health hazards are caused because of excessive bacteria growth in the cooling tower as bacteria carry­ing aerosol is the ideal pathogen for infectious diseases such as Legionella.